I’ve previously commented that weak colonies that build up very slowly in Spring are more trouble than they’re worth. 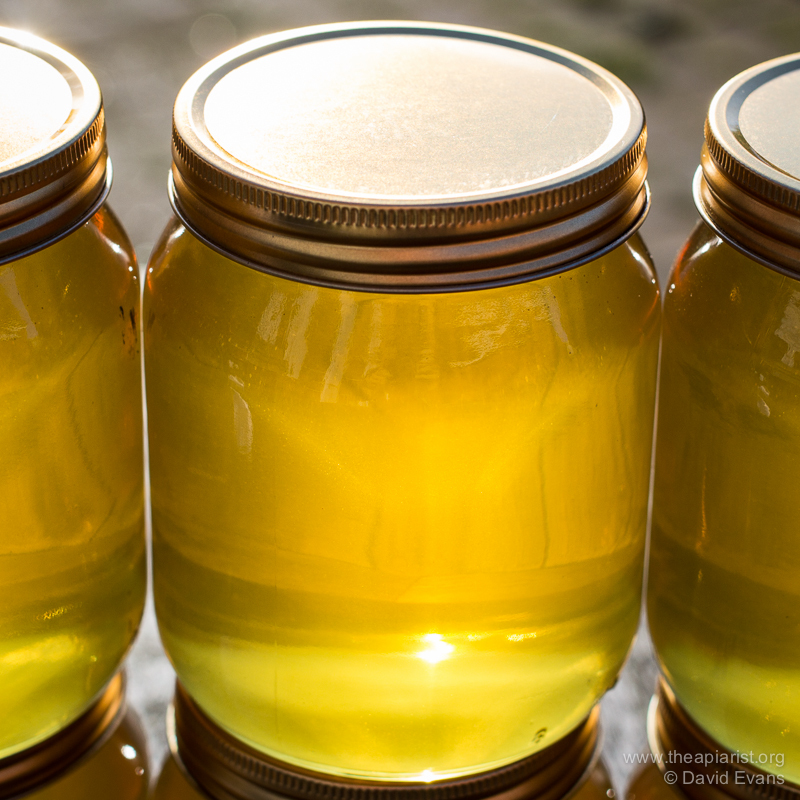 The resources they need – syrup, frames of emerging brood, more TLC – are rarely reflected in the subsequent honey yield. Quite the contrary, they’re often a lost cause and it could be argued that, from a purely efficiency point of view, it would be better if the colony succumbed during the winter than staggered on into the Spring. Better still, assuming they’re disease free, use the bees in the autumn by sacrificing the queen and uniting the colony with a strong colony. You’ll boost the latter and strong colonies both overwinter better and build up better the following year. Do as I say, don’t do as I do. All the above makes perfect sense, but a combination of sentimentality and ill-placed optimism means that it’s not unusual – in late Spring – to find myself being reminded that “weak colonies that build up very slowly in Spring are more trouble than they’re worth”. One of my colonies was undersized in late autumn and had built up very slowly this Spring. The queen was a little older than most in the apiary but she’d done well in the past and I thought she might have another season in her. 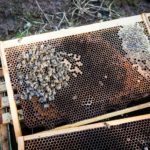 Varroa drops in late autumn and mid-winter had been very low and the bees were beautifully tempered, calm, steady on the comb and a pleasure to work with. But in the first inspection of the year (10th of May) there just weren’t enough of them. The queen was laying, pollen was coming in, there were no signs of disease and the colony behaviour remained exemplary. Comparison between colonies is very informative. That’s why it’s easier to maintain two colonies than one. Other colonies in the same apiary were building up well. By late May I was starting swarm prevention measures on these, using pre-emptive vertical splits. The small colony was largely forgotten or ignored. I peeked through the perspex crownboard a couple of times and could see they were building up. I got distracted harvesting the early season honey from other colonies, running out of frames and with more swarm prevention and control. I finally completed a full inspection of the colony on the 17th of June, shortly before the summer solstice and the first official day of summer (so still technically Spring). The colony had only a couple of frames of brood and covered a frame or two more than that. The temper and behaviour was still very good. The queen was present and laying. She was being attended by a retinue of workers and not being ignored or harassed. But she was clearly losing her faculties. Many of the cells contained two or more eggs. Multiple eggs in cells are often seen with laying workers and sometimes seen when a newly mated queen first starts laying. With laying workers the eggs are often placed on the sidewalls of cells and, as they’re unmated, they develop into drones. The brood pattern is scattered randomly around the frame. With newly mated queens the eggs are usually correctly placed in the base of the cell†. A thorough inspection of the colony failed to find another queen or any evidence of a recently vacated queen cell. Frankly this didn’t take long, the colony was simply too small to ‘hide’ either of these. Option 3 could therefore be discounted. The presence of another queen would be really important if I was considering requeening the colony or uniting it with a queenright hive – both these are likely to go badly if there was a queen still present. There was no drone brood at all in the colony and the laying pattern was clustered as would be expected from eggs laid by a queen. Option 2 could therefore almost certainly be discounted. Fortunately again as it’s difficult to requeen a colony containing laying workers. As another aside, I can’t remember seeing a colony with laying workers that also contained a (failed) queen. That left the most likely explanation for the multiple eggs (and the undersized colony) was the simple failure of the queen. For whatever reason, she was laying at a much lower rate than usual and had started laying multiple eggs in cells. Of the three possibilities, this is the most straightforward. Occam’s razor (William of Ockham, ~1287-1347) is the problem-solving principle that states that the simplest explanation is probably the correct one. The queen was removed from the colony and it was united over newspaper on top of a strong hive in the same apiary. Two days later the Varroa board underneath the colony was covered in shredded paper indicating that the colonies were united successfully. Which is what I should have done in mid-autumn last year. A few days later I rearranged the colony, placing the two frames of brood into the bottom brood box and putting a clearer board underneath the top brood box. The resulting single colony, now a bit stronger, will be well-placed for the summer nectar flow and the nine frames of drawn comb vacated by the colony will be reused making up nucs for overwintering. † Interestingly, I’ve never seen several larvae developing in cells after the multiple eggs hatch. Either the excess eggs or larvae must be removed by workers. I presume this means that the workers can’t count eggs, but may be able to count larvae – not literally of course, but by the amount of pheromones produced presumably. If they could count eggs they’d remove the excess and leave only one, making the identification of laying workers (or a recently mated misfiring queen) much more difficult. Something to be thankful for perhaps? They can, of course, identify the origin of eggs – this process is the basis of worker policing which was touched on in discussion of Apis mellifera capensis, and is of relevance to those using grafting for queen rearing. The title of this post is a corruption of The Autumn of the Patriarch, a book by the Nobel laureate Gabriel García Márquez, written in 1975. The book is about the God-like power and status of a dictator, the General, and the awe in which he is held by the people. Of course, this isn’t the situation in matriarchal honey bee colonies, the structure of which is determined as much – if not more – by the workers, the brood and the circulating pheromones. This entry was posted in Beekeeping, Queen failure and tagged Colophon, Gabriel Garcia Marquez, General, health, laying workers, queen, spring, supercedure on June 30, 2017 by David. A recent paper by Nolan and Delaplane (Apidologie 10.1007/s13592-016-0443-9) provides further evidence that drifting/robbing between colonies is an important contributor to Varroa transmission. In the study they established multiple pairs of essentially Varroa-free colonies 0, 10 or 100 metres apart and then spiked one of the pair with a known number of Varroa. They then monitored mite build-up in the paired colonies over several months. By comparison of the relative mite increases in colonies separated by different distances they showed that the more closely spaced, the more likely they were to acquire more Varroa, presumably through robbing or drifting. This isn’t rocket science. 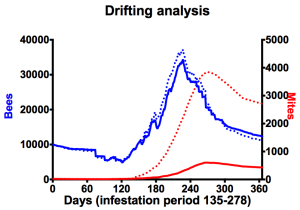 However, it’s a nicely-conducted study and emphasises the importance of colony spacing on the transmission of phoretic mites between infested and uninfested colonies – through the normal colony activities such as robbing and drifting – as a primary cause of deformed wing virus (DWV) disease spread in the honey bee population. The paper only studies mite levels, but the association with DWV transmission is well established and unequivocal. Sakofski et al., (1990) showed that there was no difference in mite migration between colonies in closely-spaced rows from those located up to 10m apart. Frey and Rosenkranz (2014) showed that high-density colonies (>300 within flight range [2.5 km] of the sentinel colonies) experienced approaching 4-fold greater inbound mite migration than when located in areas containing a low-density of treated colonies. Over a 3.5 month period the difference was 462 +/- 74 vs. 126 +/- 16 mites. This would have a very significant impact if allowed to subsequently replicate in the recipient colonies. Frey et al., (2011) previously investigated mite transfer between colonies located 1m to 1500m apart. 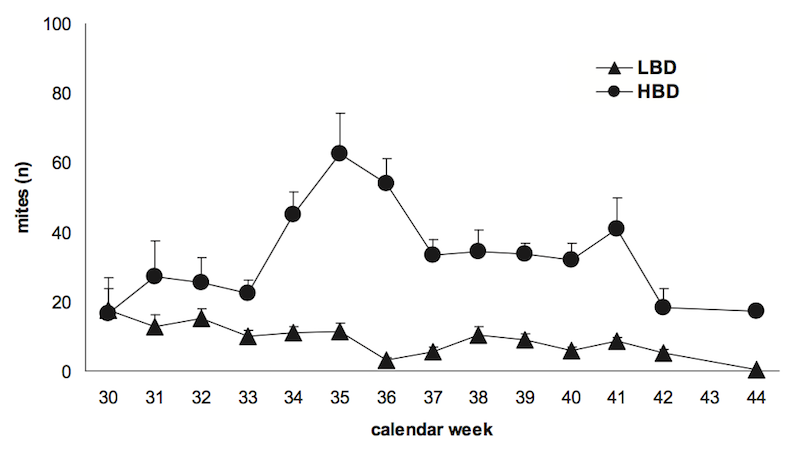 Strikingly, in this study (which was conducted during a dearth of nectar) mite transmission was effectively distance-independent, with the recipient colonies acquiring 85 – 444 mites over a 2 month period. What can we conclude from these studies? 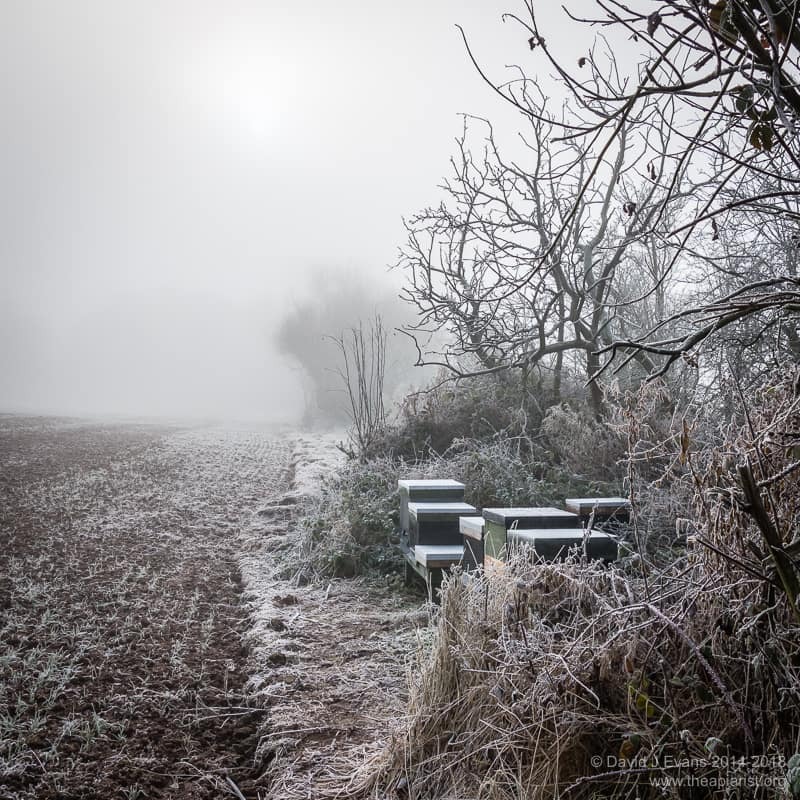 Closely-spaced colonies – for example, the sort of distances used to separate colonies in an apiary – should really be viewed as a single location as far as mite infestation is concerned. A single heavily-infested colony in an apiary will quickly act as a source of mites to all other colonies. 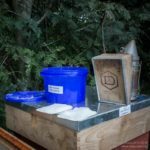 High densities of beekeepers – assuming the usual range in both the timing and vigour with which Varroa control is practised – is probably detrimental to maintaining low mite levels in your own bees. 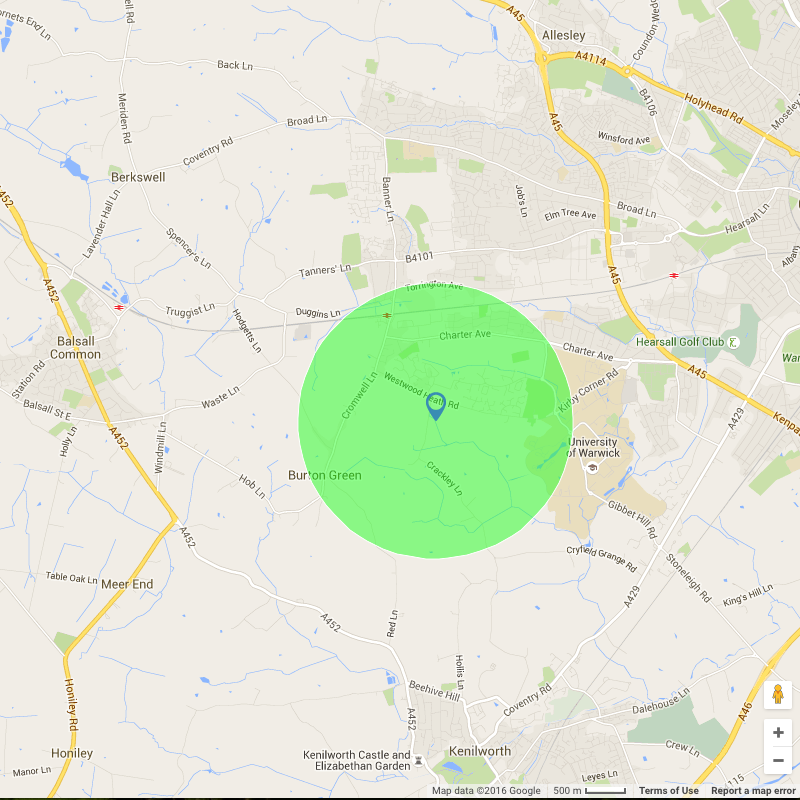 Significant mite transmission occurs over distances of at least 1.5 km … not just between hives in a single apiary. 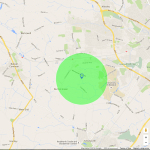 How many colonies are there within 1.5 km of your own apiary? Even if you are careful about controlling mite levels, what about all the beekeepers around you? I’ve moved in the last year from the Midlands to Fife. Beebase and my involvement with local beekeepers suggest that these represent areas of high and low colony-density respectively. For comparison, Beebase indicates that there were over 230 apiaries within 10 km of my home apiary in the Midlands and that there are currently 20 within a similar range in Fife. 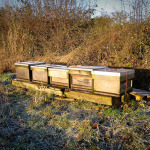 In the Midlands I was aware of at least 25 colonies (in several different apiaries) within a mile of one of my apiaries. Furthermore, apiaries might contain lots of hives … one of those previously within 10 km of my home apiary was our association apiary which held up to 30 colonies from ~15 beekeepers. In contrast, the closest beekeeper to my current home apiary is almost 3km away … though I acknowledge there may well be hives “under the radar” belonging to beekeepers that are not members of the local association or have not bothered to registered on Beebase (why not?). It’s far too early to be definitive but mite levels in my colonies have been reassuringly low this season. This includes uncapping hundreds of drone pupae – the preferred site for Varroa to replicate – without detecting a single mite. I’d like to think this was due to timely and effective Varroa control, but it is undoubtedly helped because my neighbours are further away … and perhaps better at controlling the mite levels in their own colonies. This study provides further compelling evidence of the importance of either keeping colonies isolated (which may not be possible) and ensuring that all colonies in the same and adjacent apiaries are coordinately treated during efforts to control mite numbers. 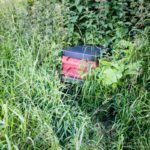 This entry was posted in Beekeeping, Drifting and robbing, Varroa and tagged apiary location, Beebase, coordinate treatment, drifting, DWV, health, robbing, Varroa on June 10, 2016 by David. 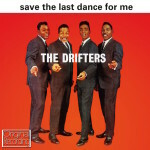 Not the legendary American doo-wap/R&B vocal group but instead a quick follow-up to a recent post on drifting in honey bees. I discovered an interesting article in a 2011 issue of American Bee Journal in which Wyatt Mangum (Mangum, W.  Varroa immigration and resistant mites ABJ 151:475) quantified mites introduced with bees from other colonies. 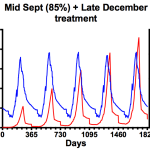 The experiment was straightforward and quite clever … a number of colonies were prepared with very low mite numbers, overwintered and then miticides (unspecified, but from the remainder of the article I’m assuming Apistan) were applied continuously for the rest of the season. This would kill all the mites present. With a Varroa tray in place it was therefore possible to count newly introduced mites throughout the season. These must arrive with drifting workers, drones (not sure if drones ‘drift’ as such … perhaps there’s a better term for their itinerant wandering? ), bees that have abandoned other colonies or potentially robbers. The newly infesting mites would of course be killed by the miticide after introduction and before reproduction. They could therefore easily be counted on the Varroa tray under the open mesh floor. 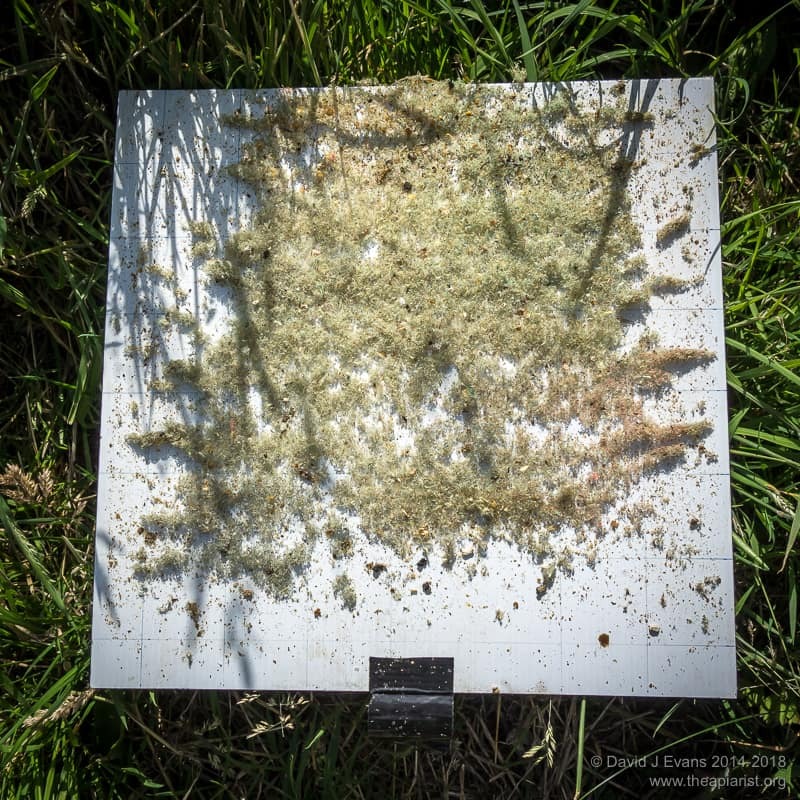 The results were striking … in one year between mid-May and early October an average of 1415 and 1001 mites were introduced to each of the seven ‘recipient’ colonies in two separate apiaries. Mite arrivals weren’t evenly spread, but peaked during a late summer dearth of nectar … perhaps, as suggested by the author, as other colonies started to run out of stores. The source colonies were not identified, but were not within the test apiaries. Whatever the cause, this represents a very significant influx of up to 7-10 mites per day. In Mangum’s experiment these mites could not replicate (due to the miticide that was always present). Had they been able to do so the impact on the recipient colony, in terms of numbers of mites transmitting viruses within the hive, would have been much greater. Using BEEHAVE this impact can be modelled. 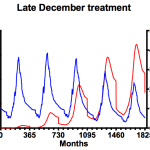 In untreated colonies (solid lines), primed with 20 mites at the beginning of the year (and default conditions as previously described), the average mite level at the year end is ~430 (n=3) having reached a maximum of ~600. 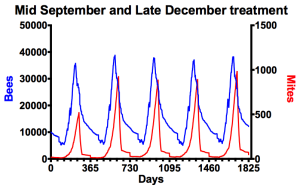 Using the same infestation period as reported by Mangum¹, with a mite infestation rate of 7/day (the lowest he observed), the average mite levels at the year end were ~2700 (n=3), with maximum levels reaching ~3800 in late summer (dotted lines). In this simulation the introduced mites can reproduce. Therefore, within just a few months, phoretic mites carried on workers and drones from other colonies, have the potential to raise mite levels in the recipient colony to dangerously high levels – significantly higher than the maximum recommended level of 1000/colony. This is potentially of fundamental importance in strategies to effectively control Varroa. It should be noted that in a repeat of his study this large scale infestation was not observed. This suggests that this type of infestation – from outwith the apiary – may only be a problem in certain years or under specific conditions. One possibility that comes immediately to mind would be a collapsing feral colony or abandoned (or potentially not abandoned, but just completely ignored and untreated … or ‘abandoned‘ as some might say 😉 ) hive within foraging distance. Interestingly, a recent study has looked at the influence of a number of honey bee pathogens on drifting (or inter-colonial transmission as they rather long-windedly call it) behaviour. 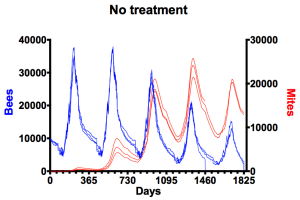 Of the viruses, Varroa and Nosema tested, only the presence of high mite levels influenced drifting … but not in the direction that might be expected. Distance between colonies in an apiary was the major factor that influenced drifting and ~17% of tested workers had drifted (with a third to half of these being apparently unrelated to other colonies in the test apiary). Surprisingly, colonies with high Varroa levels were more likely to acquire drifting workers, though the mechanism for this was unclear. The increased mixing through drifting would ensure that these colonies would likely end up with a greater diversity of viral and other pathogens though whether these colonies could, later in the season, act as a source rather than a sink for mites was not tested. 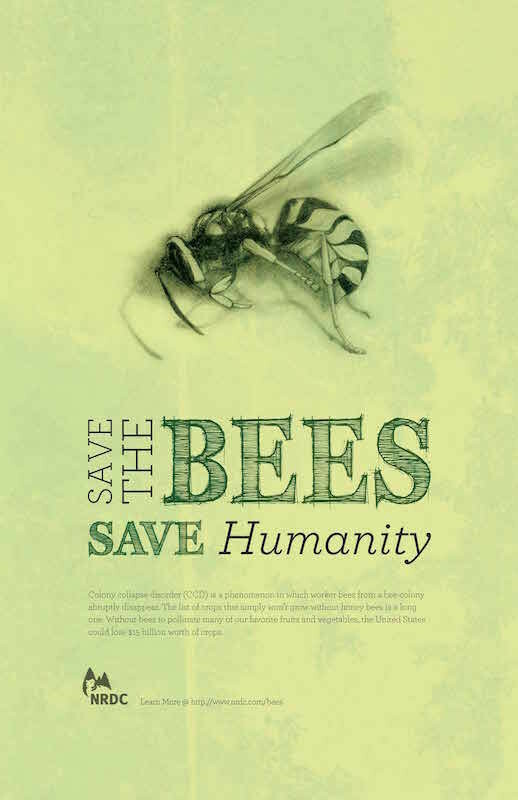 Finally, returning to the subject of drifting bees and the ABJ … in the February 2016 issue there’s an interview with Tom Seeley (of Honeybee democracy fame … Sharashkin, L , ABJ 156:157) in which he states that, when quantified, 34% of drones in his apiary colonies were from other hives. 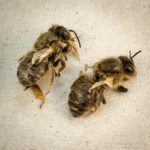 This article – on Surviving without Treatments: Lessons from Wild Bees – also discusses the importance of colony separation to coping with Varroa. The feral colonies Seeley studies are located at least half a mile apart in woodland. When recovered and relocated together in apiaries (‘beeyards’ as they’re called in the US) they rapidly succumb to mite-transmitted viral diseases, whereas those maintained some distance apart (30+ metres) survive. Seeley makes the point that pathogens evolving in closely-spaced colonies are likely to be more virulent, whereas those that are in distantly spaced colonies should be less virulent (or they’ll kill the host colony before being transmitted). Seeley is referring to the virulence of Varroa but I think his comments apply better to the viral payload carried by the mite. This is a relatively minor distinction but these observations further emphasise that drifting in honey bees is clearly a major factor in mite, and consequently disease, transmission … and therefore needs to be considered in control. 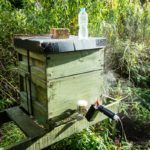 STOP PRESS – A recent Bee-L post highlighted a further study on the influence of re-infestation. 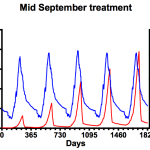 Greatti et al., (1992) showed that ~2-14 mites/day/colony were acquired in their test apiary during June-August, and that this number rose to up to 75 mites/day/colony in September and October². This type of re-infestation can occur by drifting as already discussed, or by workers in the sentinel colonies robbing out mite-infested collapsing nearby hives or feral colonies. 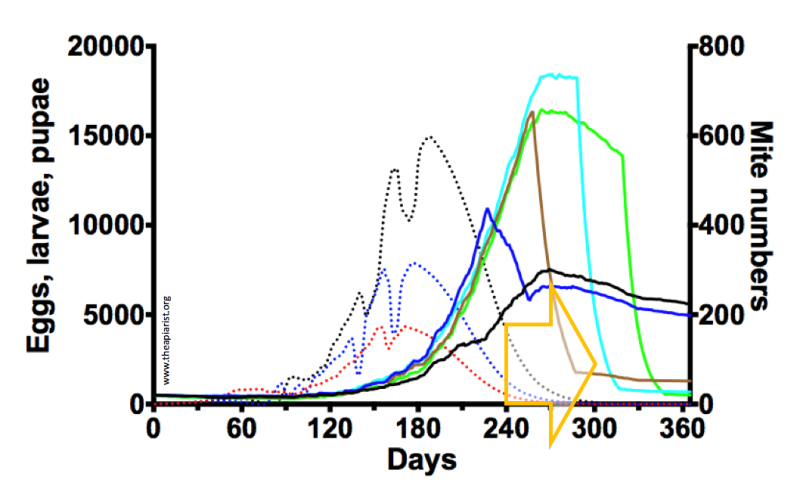 ¹In the Mangum study the mites did not infest the sentinel colonies at an even rate of 7+/day. Instead there was a marked peak in mid-season. I’ve not attempted to model this. Clearly if mites don’t arrive earlier in the season the overall levels would be lower (as they wouldn’t have the chance to reproduce). However, an influx of mites in mid/late-season might just arrive at the wrong time to damage the all-important winter bees … the topic of a future post. 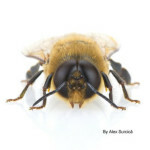 This entry was posted in Beekeeping, Drifting and robbing, Varroa and tagged ABJ, BEEHAVE, Ben E. King, doo-wop, drifting, health, Mangum, R&B, seeley, Varroa on January 29, 2016 by David. 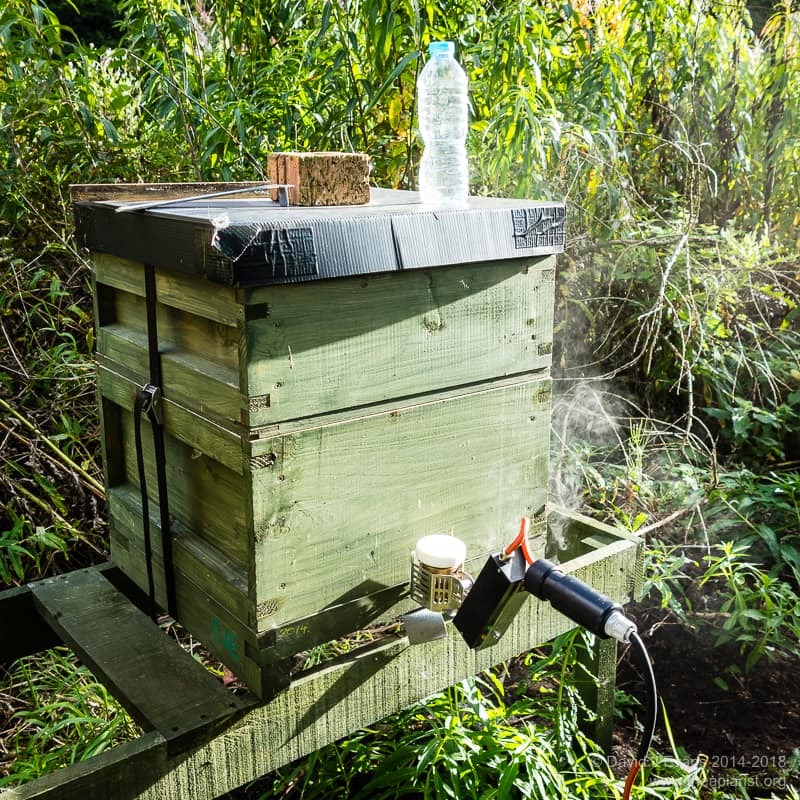 During previous research on deformed wing virus (DWV) biology and its transmission by Varroa I’ve moved known Varroa-free colonies (sourced from a region of the UK which the mite has yet to reach and maintained totally mite-free) into apiaries in the countryside. 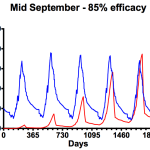 Within 2-3 weeks Varroa was detectable in sealed brood, showing that mite infestation occurs very readily. I know other researchers who have made very similar observations. Where do these mites come from? The obvious source would be the phoretic mites transported on workers ‘drifting’ from nearby infested colonies, or on drones which are known to travel quite long distances and may be accepted by almost any colony. If you want to see how frequent this is try marking a few dozen drones with a dab of paint. To avoid confusion use the colour used to mark queens next year. There are unlikely to be 4+ year old queens in the apiary and the drones will all perish before the end of the current season. Over the next few days and weeks the drones will appear in adjacent colonies, and some will likely leave the apiary and be accepted in your neighbours colonies. Beekeepers are usually aware that colonies at the ends of rows often ‘accumulate’ bees that have drifted when returning to the hive. In shared association apiaries some crafty beekeepers will site their colonies at the ends of rows to take advantage of the ‘generosity’ of other colonies. However, many beekeepers probably do not appreciate the extent to which drifting occurs. Pfeiffer and Crailsheim (1998) report that 13-42% of the population of a colony are ‘alien’ i.e. have drifted from adjacent hives, depending upon the time of season. Remember that drifting occurs in both directions simultaneously, so the overall numbers of bees in a colony may not be adversely affected (or boosted). In other studies Sekulja and colleagues (2014) showed that ~1% of marked bees drifted between colonies over a three day observation window. 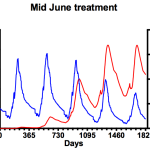 Interestingly, American foulbrood (AFB) infected bees drifted slightly more than uninfected bees. Spread of foulbroods during drifting is one reason the bee inspectors check nearby apiaries when there is an outbreak. These studies were all on workers where drifting primarily occurs during orientation flights before the bees become foragers. Drones drift two to three times more than workers (Free, 1958). 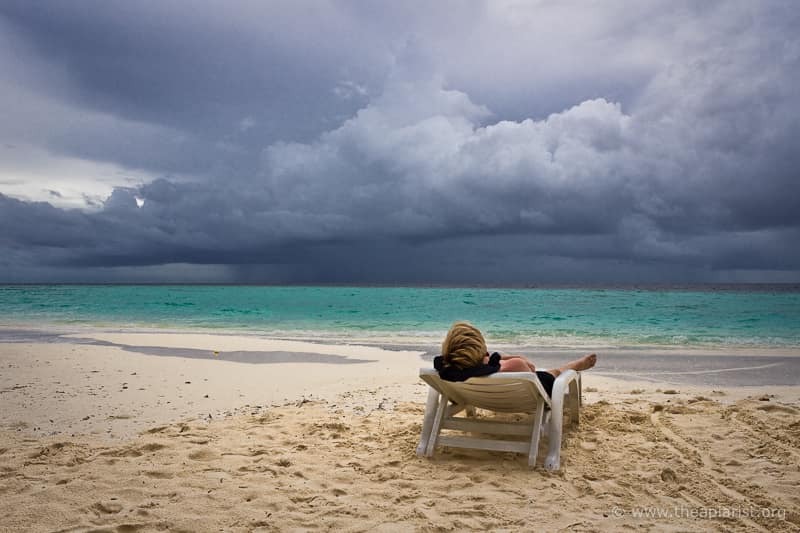 The likelihood of drifting must be closely related to the separation of hives and apiaries. Although workers will forage up to 2-3 miles from the hive I suspect the proportion of bees that drift this distance is extremely small. However, unless you’re very isolated I expect there are other apiaries within a mile or so of your own. Drones are known to fly up to about five miles to reach drone congregation areas for queen mating and are accepted by all colonies. I’ve regularly found drones appearing in (relatively) isolated mini-nucs. I’m not aware of studies that have formally tested drifting between apiaries (though it is reported in passing in the Sekulja et al., 2014 paper cited above). So, your hives probably contain workers and drones from other nearby colonies, and you can only really be sure that they’re all “your” bees if you live – as the sole beekeeper – on an isolated island. Not only does your neighbour generously exchange bees with you, he or she also kindly shares the phoretic mites those bees are carrying, the viral payload the bees and mites are infected with and – if you’re really unlucky – the Paenibacillus larvae spores responsible for causing AFB infection (and vice versa of course). There are lessons here that should inform the way we conduct our integrated pest management to maintain healthy colonies. 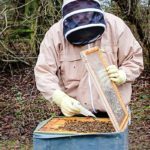 This post provides background information for an article (“Viruses and Varroa: Using our current controls more effectively” by David Evans, Fiona Highet and Alan Bowman) in the December 2015 issue of Scottish Beekeeper, the monthly magazine for members of the Scottish Beekeepers Association. 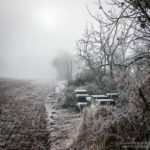 This entry was posted in Beekeeping, Diseases, Drifting and robbing, temp, Varroa and tagged drifting, DWV, health, IPM, Varroa on December 6, 2015 by David. Other users of these floors also claim the absence of draughts is a benefit but, since they also have open mesh floors, I don’t think this is likely to make much of a difference. I’m only aware of three disadvantages of this type of floor. There can be a high loss of bees from the colony during long cold winters. 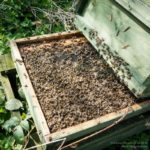 This is generally not an issue during the depths of winter, but as the weather warms slightly and the colony becomes more active – and, inevitably, the overwintering bees get older – the attrition rate rises. If the weather still isn’t warm enough for the corpses to be removed they can end up blocking the entrance. Twice in recent years I’ve had colonies trapped inside. In both cases these went into the winter as strong double-brood colonies and – due to work commitments – weren’t checked for 4-6 weeks in late January-early March. In both cases I managed to save the colonies, but they were severely stressed by the situation, with signs of Nosema, and needed mollycoddling for several weeks at the start of the season proper. Fortunately there’s an easy solution. On your weekly apiary winter checks (or however frequent they are) push a bent piece of wire into the entrance, turn it to project up through the vertical part of the entrance slot and slide it along the full width of the hive to ensure the entrance is clear. 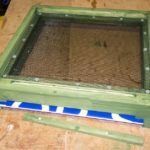 Any old piece of wire should be suitable as long as it it short enough not to foul the bottom of the frames. 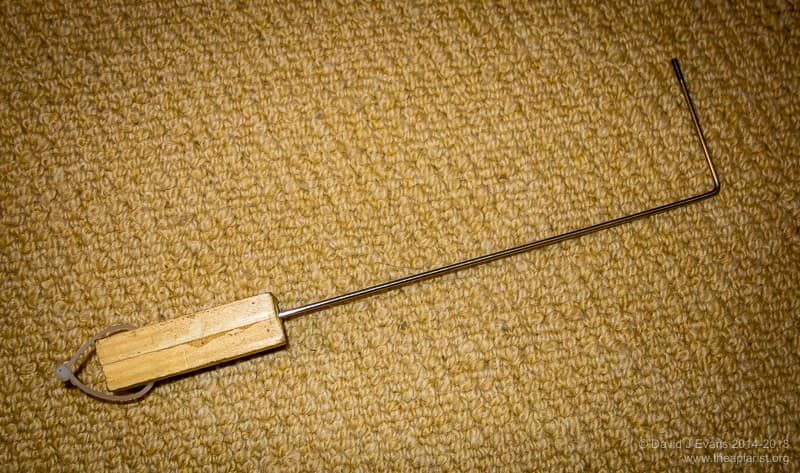 For a few years I used an easily-lost piece of wire coat hanger. More recently I added a handle to a stainless steel bicycle spoke … with a little hook so it can hung up in a “safe place” (which, of course, is no guarantee whatsoever that it won’t be lost 🙁 ). This entry was posted in Beekeeping, Floors, Seasonal and tagged floors, health, hive, winter on December 4, 2015 by David.